Search and adopt a Pointer near you. The Pointer should be athletic and graceful. The immediate impression should be of a compact, hard-driving hunting dog. Possessing stamina, courage, and the desire to go. A short coat can be liver, lemon, black, and orange; either in combination with white or solid-colored. The Pointer's even temperament and alert good sense make him a congenial companion both in the field and in the home, but he requires both physical and mental exercise. Ranging in size from 23 to 28 inches tall at the shoulder and 44 to 75 pounds. Pointers first appeared in England around 1650. AKC recognized in 1884. Pointers were often used to locate and point hares. The Pointer's lineage is foggy, but there is no question that it includes Foxhound, Greyhound, and Bloodhound crossed with some sort of "setting spaniel," which played an important part in the creation of all modern bird dogs. Grooming English Pointers is not time-consuming. Their coat is very short and needs only a quick rub with a soft brush to minimize shedding. Pointers are even-tempered, congenial dogs happiest living indoors as part of the family. Pointers are affectionate and loyal. Their aggression level is very low to non-existent and they can happily co-exist with other dogs and often cats. Pointers are typically not territorial, although their size and bark will intimidate most people who come to your door. Pointers are very good with children. While Pointers were bred to be a hunting dog, they are perfectly content given adequate exercise in a non-hunting home. Since they are a galloping breed, regular exercise is important for them, as it is for all sporting breeds. A good sized, securely fenced yard is a must to keep a Pointer safe since they are bred to hunt a good distance from their person. The average life span of a Pointer is 12 to 17 years. Pointers are fairly genetically sound as a breed. 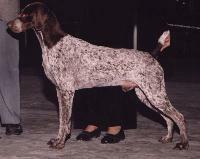 Pointers were brought to the US where the breed flourished in the abundant open hunting land. Pointers also work game birds such as the pheasant, grouse, and woodcock with success as well.